Renovated wine cellar with garden : a rare find with numerous possibilities. Pretty village house with character and 90 m² of living space just 5 minutes from the beach. Béziers is located on the banks of the River Orb in Languedoc-Roussillon. The second largest town of the department of the Hérault with 80,000 inhabitants, Béziers is a town with a rich historical past. And being only just over six miles from the beach as well as near the mountains, it has a lot to offer those looking for attractively priced property in a good location. You may also have heard of its very successful local rugby team. Béziers was already a fully functioning and vibrant city when the Romans arrived in 35 BC. Since then, however, the town has taken on a new charm and has preserved its Roman feel. The amphitheatre is absent as it was dismantled to provide stone for the city's walls. However, you can still find the pattern of where it existed if you look at the arrangement of houses in the city centre. In 1209, Béziers was under siege by crusaders. The residents were given the option to leave but refused, later resulting in their violent deaths as much of the city burned to the ground. Over the subsequent years, residents attempted to restore Béziers. However, they had to wait until the 19th century until a boom in vineyard harvesting saw the city return to its original affluence and beauty. Currently (2013) the city is going under intensive renovation, with a relatively new shopping centre already open for business near the station, with cinemas and restaurants. The vineyards now dominate the landscape in the hills around Béziers and provide the main backbone to the city's economy. 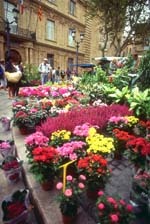 If you're there on a Friday then make sure you don't forget to visit the impressive flower market. Any other the time of the week, you can still stroll the streets visiting its large number of brasseries and department stores, as well as churches. In the evenings, a number of bars and disco's light up to provide entertainment for both young and old. Languedoc-Roussillon is an expensive region and Béziers, being an ever more popular spot, is no exception. However, it does compare favourably to cities of similar size. The city has its own airport but unfortunately does not have many flights from the UK. Currently only Ryanair flies here from Bristol, Stansted and Luton. There are flights from Southampton too, in high season. But the surrounding cities of Montpellier, Carcassonne, Perpignan and Nîmes all have flights running from the UK, so there is plenty of scope to shop around for cheap flights. Do you know Béziers better than we do? Do you have photos of Béziers? In the south of the Herault department, just in from the coast. Access: The nearest airports are Carcassonne and Montpellier, apart from the airport in Béziers itself. Montpellier also has a TGV station. 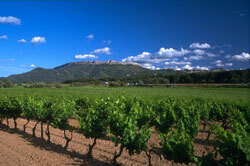 Economy: The vineyards that surround the town provide it with a stable wine growing market. Interesting fact: The town has a magnificent town centre, one of the largest in France.